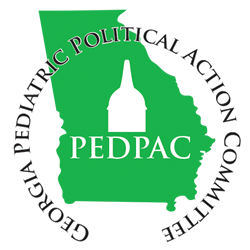 The Georgia PEDPAC was formed by the Georgia Chapter of the American Academy of Pediatrics as a Political Action Committee (PAC) to raise funds to support candidates for the state office who are supportive of health and safety issues for children and the issues that impact the practice of pediatrics. PEDPAC makes sure our voice is heard in the State Capitol on behalf of children. Please consider making a contribution today. Click here & print out form to make a contribution. The Georgia PEDPAC is a voluntary political organization. Contributions are not limited to suggested amounts. Contributions to GaPEDPAC are not deductible for federal income tax purposes. Upon submission you will be taken to a secure payment system.